1.5 is complete! Huge update this time. One new feature is that 1.5 keeps track of cleared space from when you add a new entity or expand a layer (since it moves the data elsewhere) and reuses that space later. So it should be much harder to hit the cap for sector overlay sizes now, which is good if you want to make a bunch of big rooms or add a lot of entities. 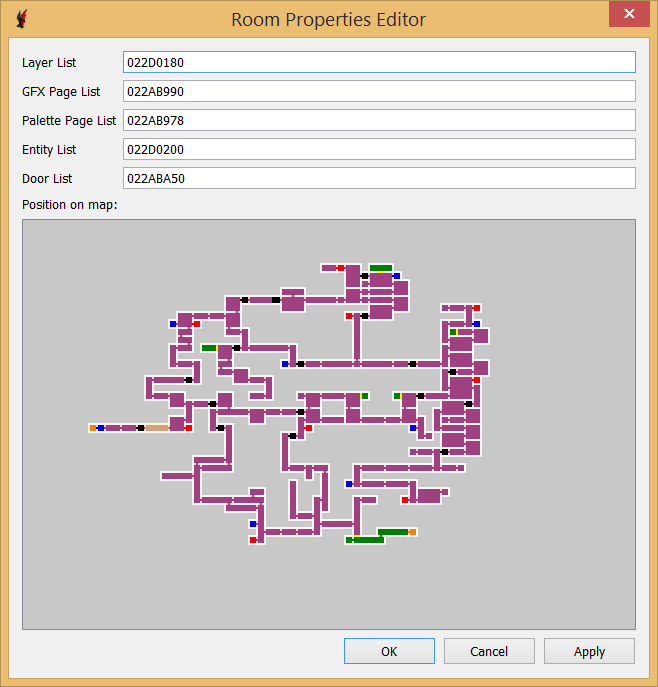 For AoS support, the major features such as editing rooms, items, enemies, etc should mostly all work. But if you try to add a new entity or change the size of a layer it will crash. And the smaller editors don't support AoS at all yet. GBA seems to be the only system where it correctly loads things, though. Messing with the DS games requires a running emulator. In addition to the enemy/object/skill code I dumped, I also put in functions I know about from manually looking through ASM code, and documented what I know about them. 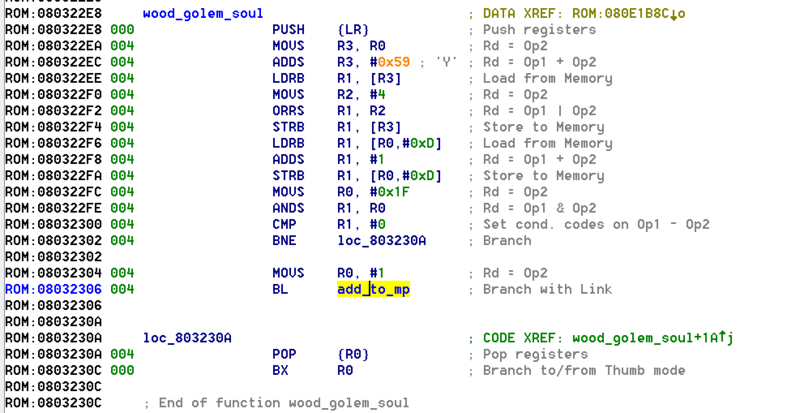 For No$GBA to use one of these files, it has to be in the directory where the ROM is and have the same name as the ROM but a .sym extension. Like "built_rom_aos.sym". Wow, AOS support, I hope you keep going and get HOD and COTM. I know HOD should be straightened out so each castle looks unique. I always get the two confused. Never should have opened them both up at the same time. After AoS support is complete I'll look into HoD. I think it will be doable, though there do seem to be some differences compared to AoS. CotM seemed pretty drastically different from the brief look I gave it, but I'm not sure yet. Julius souls are stored at 0xE1ED8 and have a length of 0x10. I'm probably going to swap them over over some bad Soma souls when I finish up this project I'm working on. I haven't messed with the DS games in a bit since the GBA randomizer has some popularity and the project I'm working on will make that even better. Well that is probably because CoTM was not made by IGA and his team so that game will definitely have a different sort of code than the ones you have been working on, that being said I myself personally would MUCH rather see support for CoTM rather than HOD considering I feel its the stronger of the two, just my two cents, GREAT update by the way I'm LOVING this tool. I'm not sure since I don't own windows XP, but I think I've read that Ruby 2 doesn't work on XP. So let's go with no, DSVEdit doesn't support XP. So, how's the progress on Harmony of Dissonance and Circle of the Moon? No progress on those, I'm not starting HoD until AoS support is complete since AoS still has a number of things I don't understand and just ignored to get the editor mostly working. Based on what DarkPrinceAlucard said CotM will probably be so different that support for it won't be possible at all. 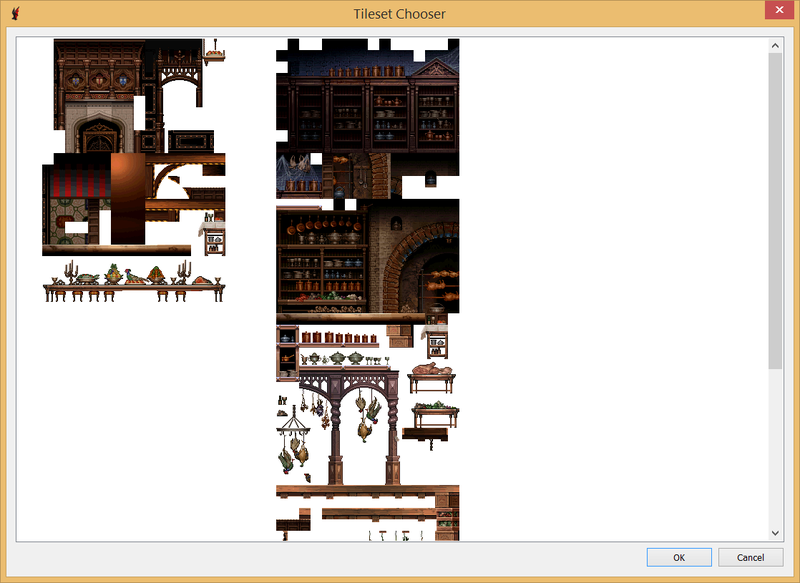 I've been making progress on AoS though, I got the GFX editor and tileset editor working, you can add new entities and layers and change the size of layers, and right now I'm trying to figure out how those star backgrounds in chaotic realm and rotating gears in clock tower work. But mostly I've been focusing on another project, separate from DSVEdit, which I think I can release pretty soon. Keep up the good work with whatever project you do! I'm quite fascinated by all this already. Take your time and do what works best for you. I'm really looking forward to that Aria of Sorrow support. I'm trying to fix the typos on portrait of ruin ("Richiter", "Charotte"), using DSVania 1.5, but the strings don't show up on the text editor or anywhere else. They're actually images, so you need to use the gfx editor to edit them. Richiter is in /sc/f_seleob1.dat with palette 022C5110. Charotte is in /sc/f_equipob0.dat with palette 022C2C5C, and you need to check the one dimensional mode checkbox. No, that's not really possible. The code for going in walls is all in the paries skill code itself, meaning you need to have paries equipped and use it to go in walls. In Albus mode he has his gun Agartha equipped as his back glyph, so if you gave him paries instead he wouldn't be able to shoot his gun. Also it'd be weird that you activate paries with Y instead of R, because of the way Albus's controls are laid out. Besides, I think using the touch screen to warp around with Albus is fun, unlike the arbitrary and frustrating magic seals in DoS, so even if it is somehow possible I'm not planning on making that patch. Thanks for the help, shame that you can't make that patch for OOE. I'm try to remedy Albus' mandatory touchscreen teleport, by removing collision from tiles then placing a movement blocker inside a wall, then putting a entity hider, so that only albus can get through. But i can't find the collision editor anywhere. Good job with the typo fix, I tested it and it worked fine. Sorry for the delayed response btw, RHDN doesn't seem to send me notifications anymore. I am a Chinese hacker，but My English evel in general. So when replacing enemies in Harmony of Dissonance, you have to change not just the enemy ID, but also a pointer to some LZ77-compressed data? Thanks for the info! I haven't started hacking HoD yet, but that sounds like it will be helpful to know when I do. 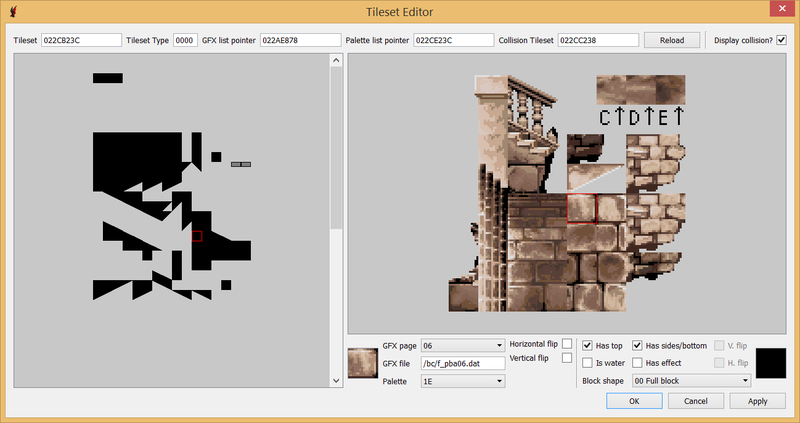 Check this sprite editor tool, maybe it will come in handy. I made lots of progress with AoS support: I fixed bugs in how sprite animations and rooms are displayed, I got weapon and soul sprites to show up correctly, I implemented text encoding, added boss rush, got the music editor working, etc. AoS support should now be about the same as the DSVanias now, but let me know if you find any bugs. 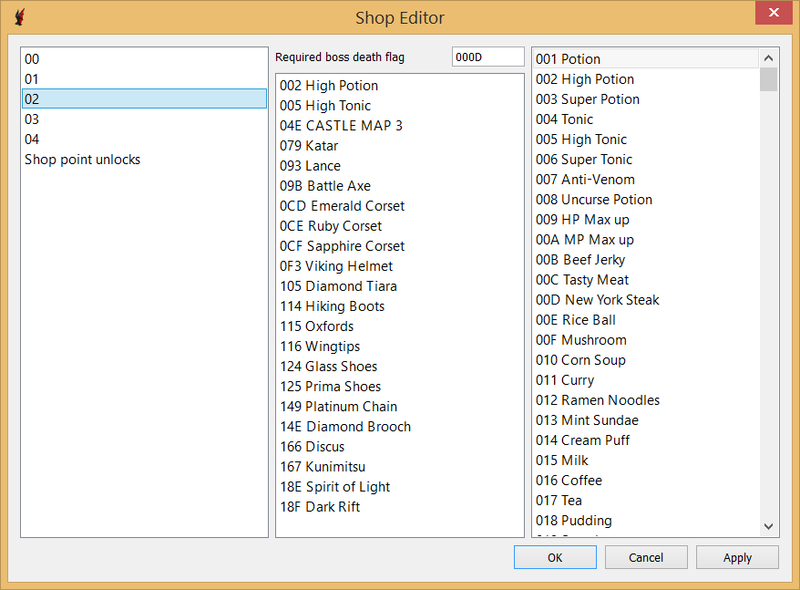 Note that the player editor can't support AoS since player's are hardcoded in AoS. 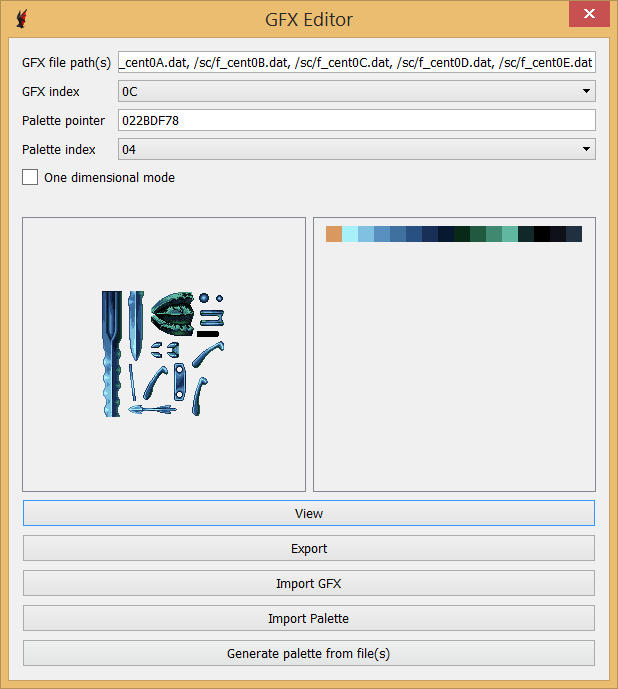 I improved the GFX editor so that you can work with multiple files at once, exporting them all and importing them all simultaneously. And if you try to import an image that has colors that don't match the current palette, you're given the option to automatically convert that image to use the correct palette, so you don't need to manually do that. I also added a palette editor built into the GFX editor so you can edit the palette without needing to export to an external image editor. Thanks for this suggestion! Turns out this program was exactly what I needed to get sprite editing working, it has a much better UI than what I can write when it comes to something this complex. I wrote an exporter and importer for darkFunction's formats, so now you can just select a sprite in DSVEdit's sprite editor, export it, open in darkFunction and edit it, then import it back into DSVEdit with the sprite editor. darkFunction has some limitations, like how it doesn't support palettes, only supports a single image, and doesn't have built in support for hitboxes, but I managed to get around these limitations to fully support sprite editing. Now you can not only modify animations, but also add new frames and animations and parts and hitboxes, so you can effectively make entirely new sprites now. The readme now includes basic instructions on how to use it to edit sprites. If anyone has issues with it let me know. For now, I'm gonna go back to focusing on my DSVania Randomizer and adding new options to it. At some point I'll see about adding Harmony of Dissonance support to DSVEdit, but I suspect it'll be a while before that happens.